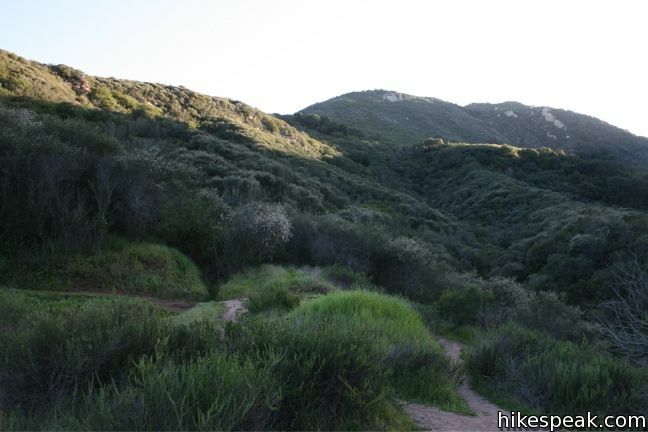 Hondo Canyon Trail is a well maintained section of the Backbone Trail that crosses fields of grains and forests of bays as it climbing 1,550 feet over 3.8 miles. 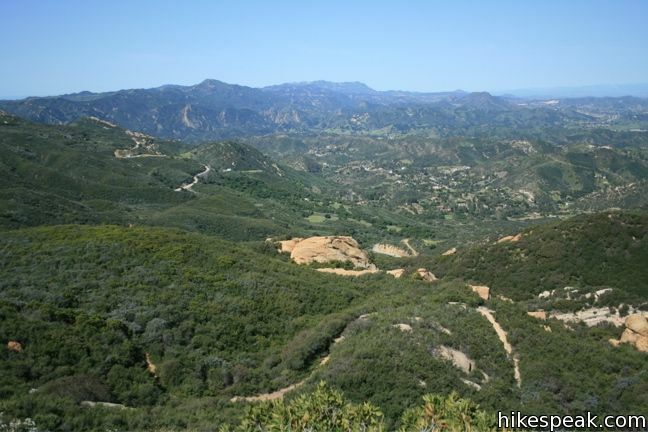 The trail passes through a quiet section of the Santa Monica Mountains west of Topanga Canyon. 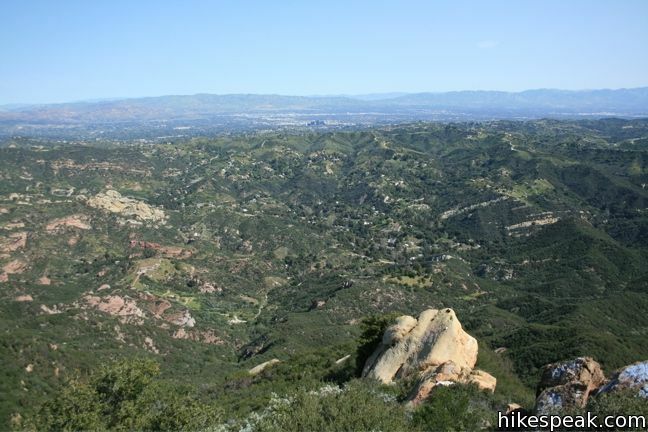 Hondo Canyon Trail meets roads at both ends and can be hiked as a one-way trek with a car shuttle or a 7.6-mile out and back hike without one. 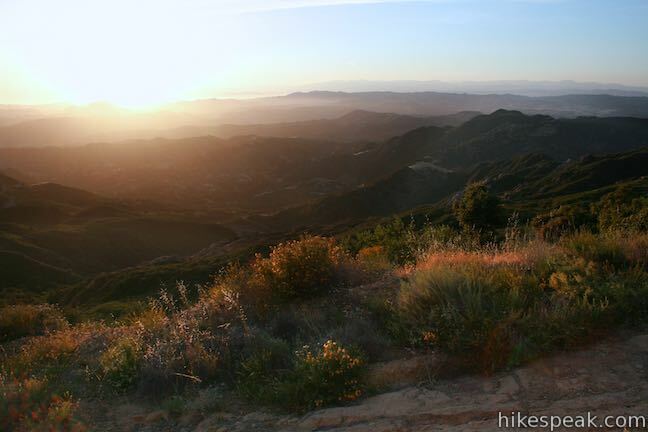 To make the high point of a hike up Hondo Canyon Trail more rewarding, you can continue up the Backbone Trail to either Topanga Lookout or Saddle Peak, extending the hike to 10.6 miles round trip. 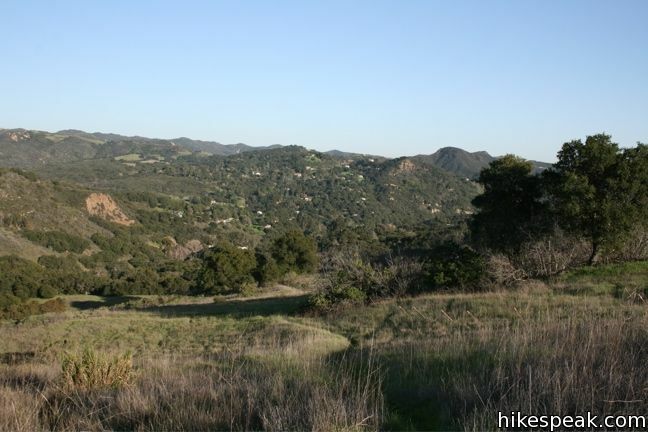 The bottom of the trail is located along Old Topanga Canyon Road 0.4 miles west of Topanga Canyon Blvd. 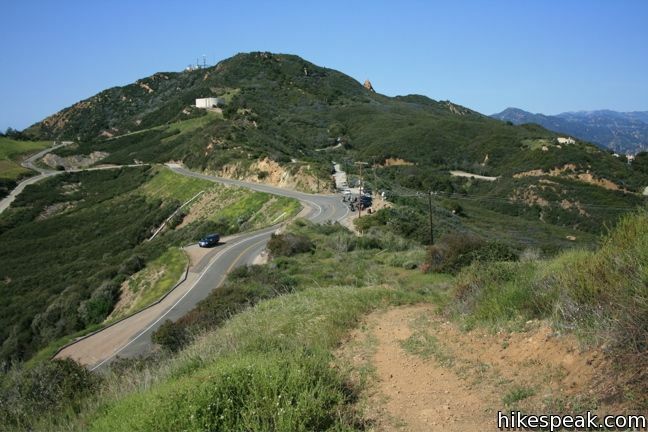 Look for the Botts’ dots built into the road, which slow traffic through this area of ample roadside parking. 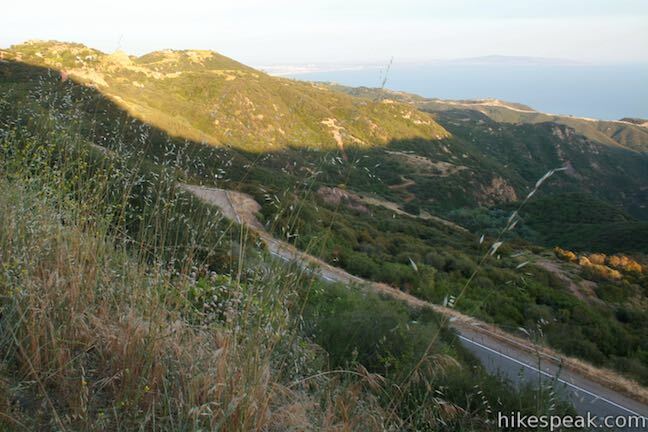 Start down the single track leading from the southwest side of the road. 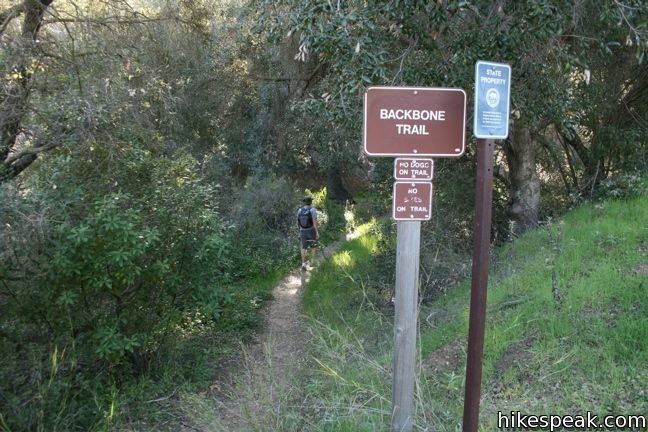 A sign is posted that reads, “Backbone Trail.” Immediately, the trail crosses over a shallow creek where some rock hopping is required. 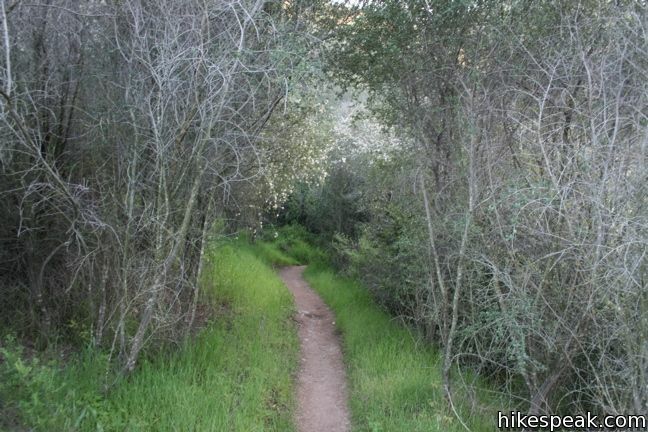 On the other side, follow the trail to the right as it climbs up fields of green grasses. 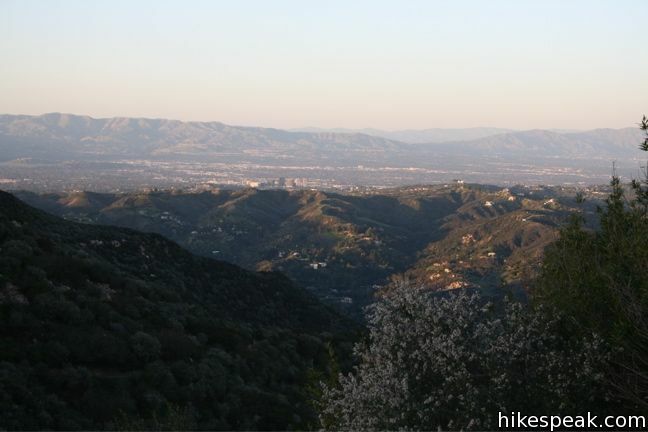 Deer are often visible in this area which offers an excellent perspective over Topanga and the surroundings. 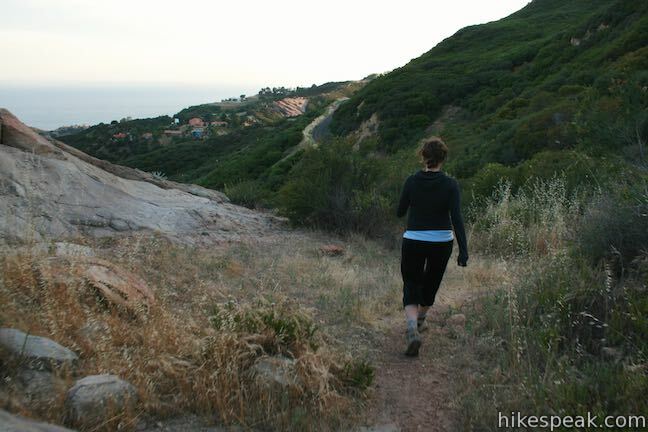 The trail remains easy to follow as it approaches Hondo Canyon, crossing a rocky perch with a nice view up and down the canyon. 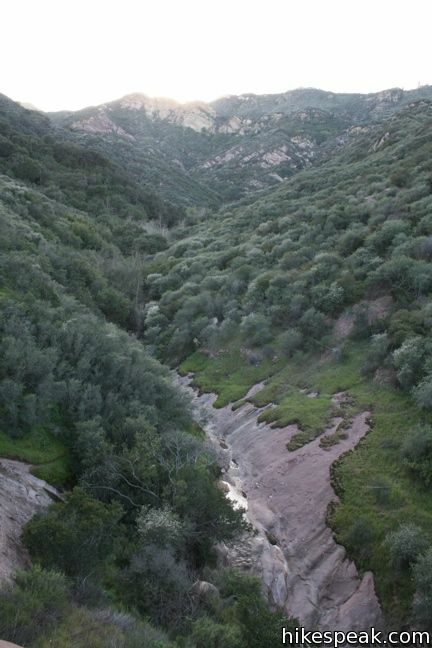 From there, the track climbs the east bank of the canyon, staying high above the small creek below. 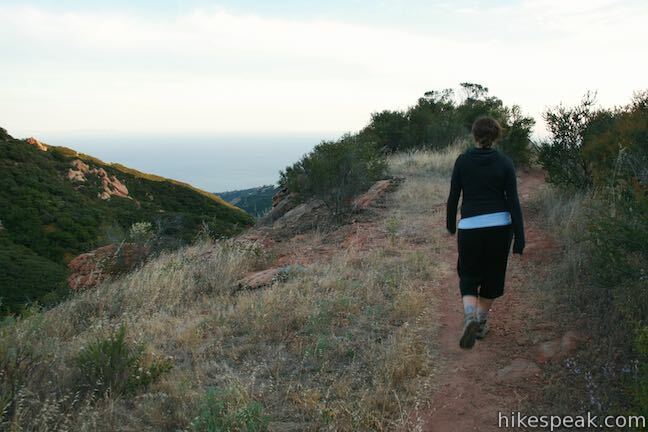 The trail switches through a dense forest made up largely of California bays (and a patch or two of poison oak). 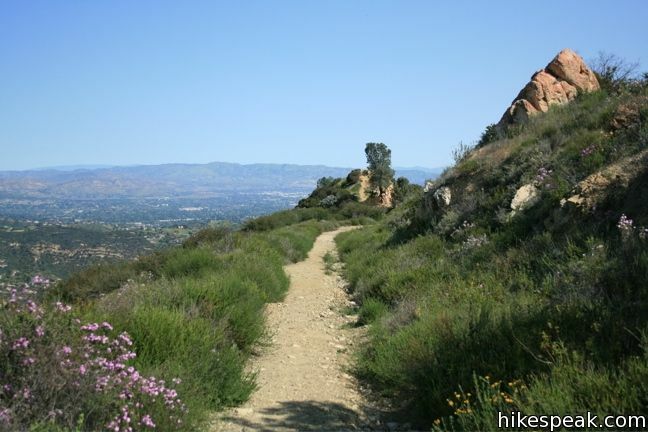 In the spring, flower seekers will find intermittent purple nightshade and tree poppies along the trail. 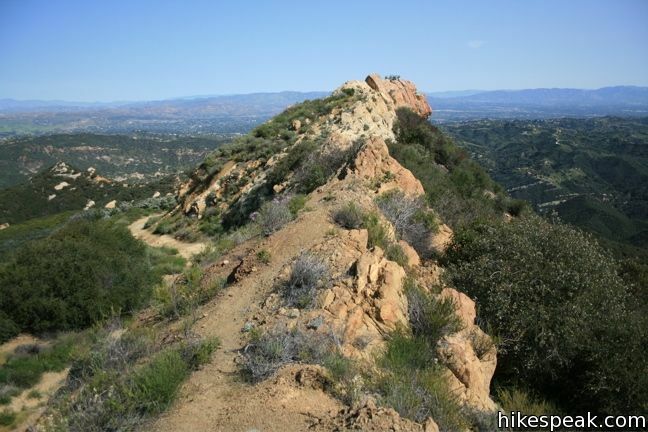 The top of the ridge is never out of sight for long, but it takes an awful lot of switchbacks to achieve. 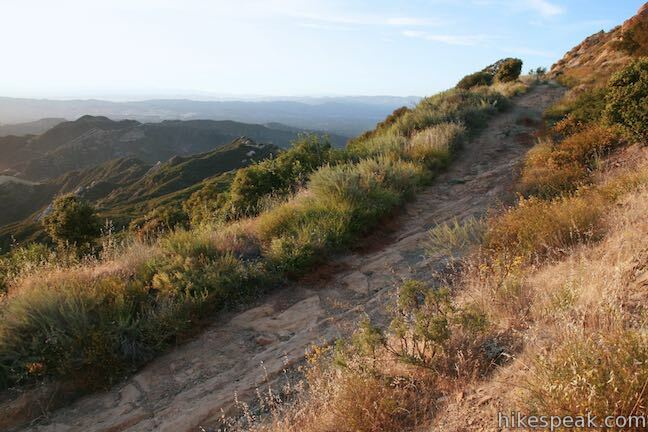 The trail finally reaches Saddle Peak Road, where one one gets a view down the other side of the ridge at the ocean below. 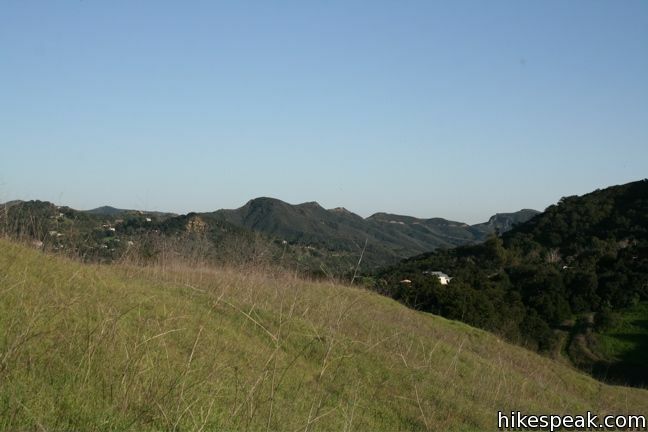 Cross the pavement and trot up the opposing ridge to gain a slightly better perspective down on the big blue. 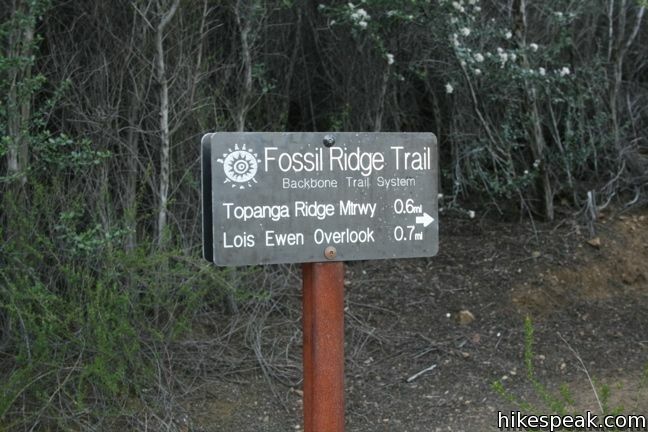 Extending the hike: From the top of Hondo Canyon Trail, a section of the Backbone Trail labeled “Fossil Ridge Trail” continues west above the road for 0.6 miles, connecting to Lois Ewen Overlook at the base of the trail Topanga Lookout (the Lookout is 0.9 miles from the junction). 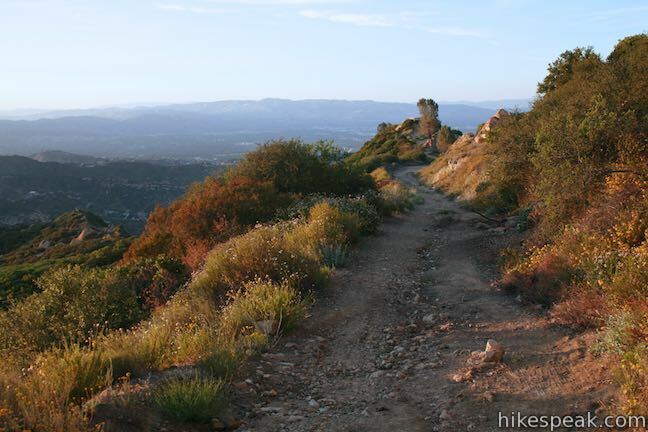 Just across the pavement, the Backbone Trail continues, reaching Saddle Peak after one mile. 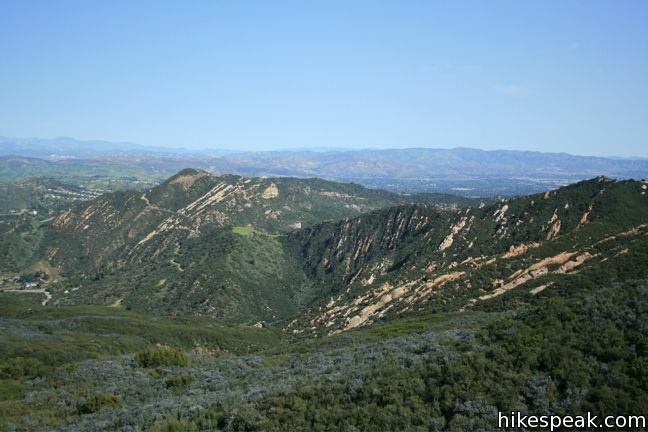 Both extensions are highly recommended, and add sweeping views to the secluded hike up Hondo Canyon. 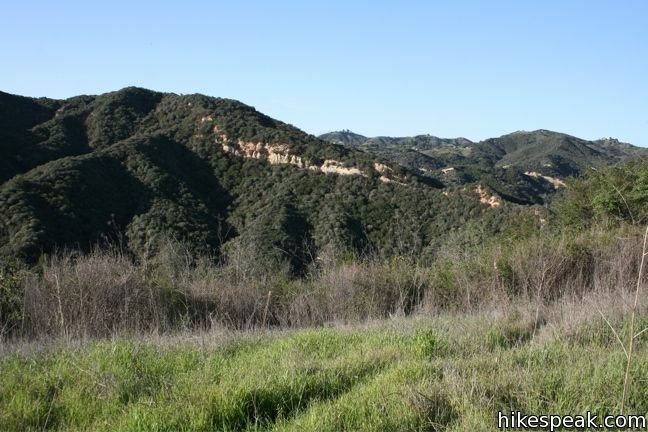 Those who parked back on Old Topanga Canyon Road must now hike back down the Hondo Canyon Trail for a 7.6-mile hike (or a 10.6-mile hike with one of the extensions). 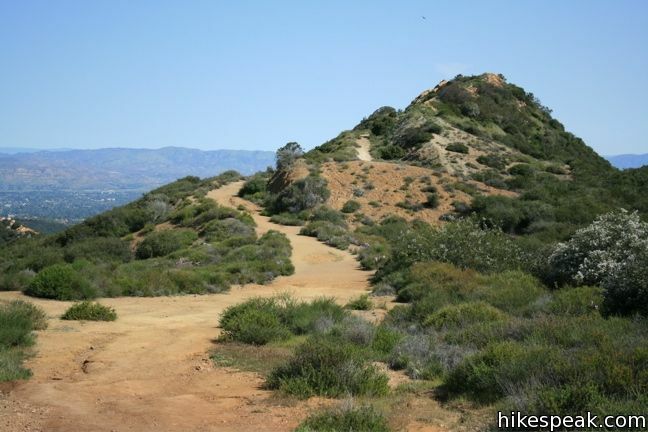 The Santa Monica Mountains has several other great long hikes in addition to Hondo Canyon Trail, like Stunt High Trail to Saddle Peak, Parker Mesa Overlook, and Sandstone Peak. 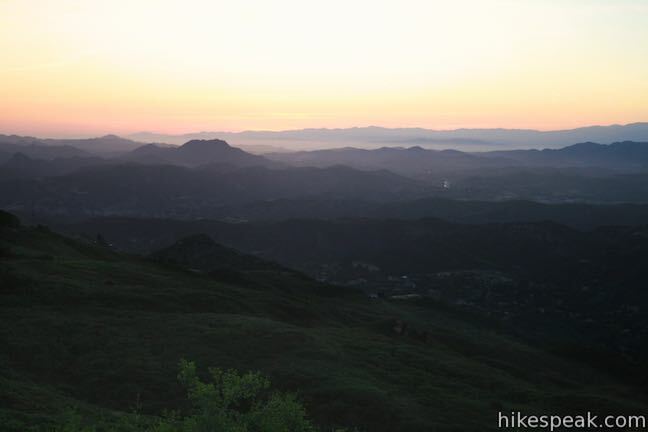 Dogs and bikes are not permitted, but no fee or permit is required, so get out and enjoy! 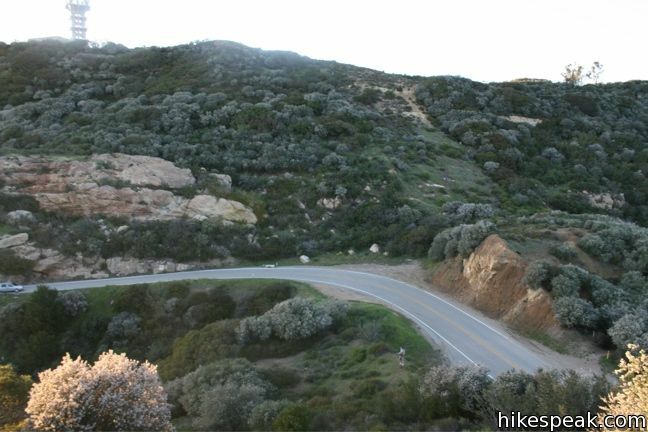 To get to the trailhead: From PCH, take Topanga Canyon Road inland for 4.3 miles. 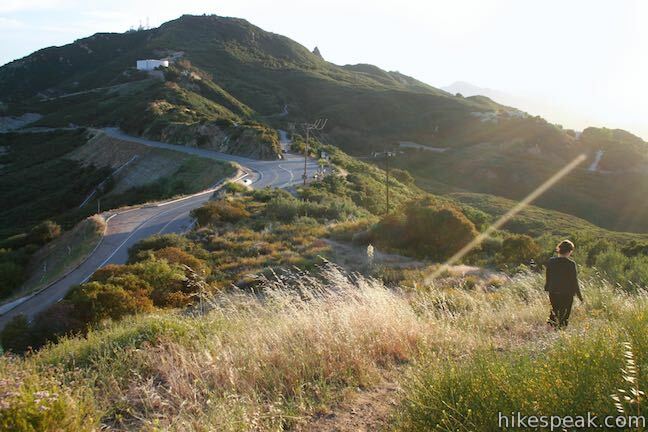 At the first major intersection, turn left onto Old Topanga Canyon Road. 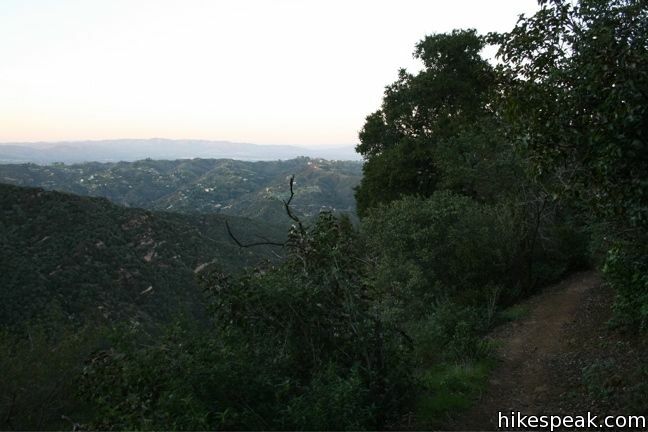 After 0.4 miles, park along either side of the road and locate the marked trailhead on the southwest side of the road. 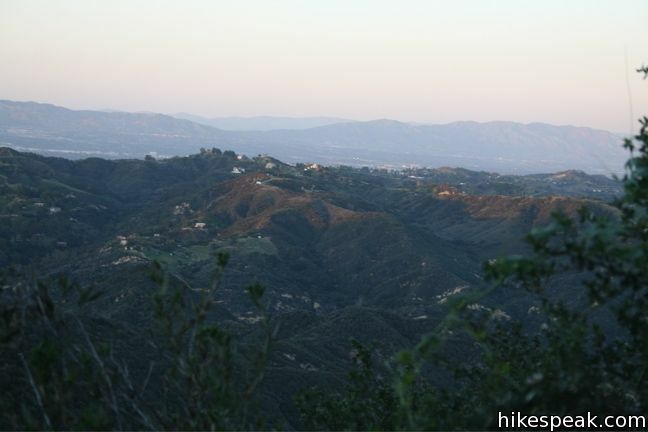 These photos were taken in February of 2010, March of 2010, and July of 2012. Click to enlarge. 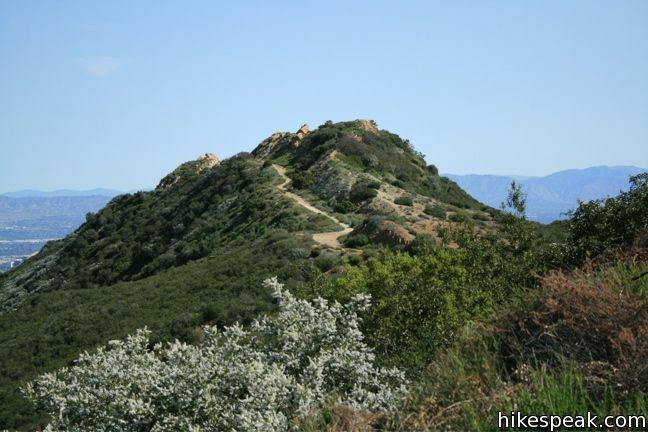 This 2-mile hike approaches Saddle Peak from the east. 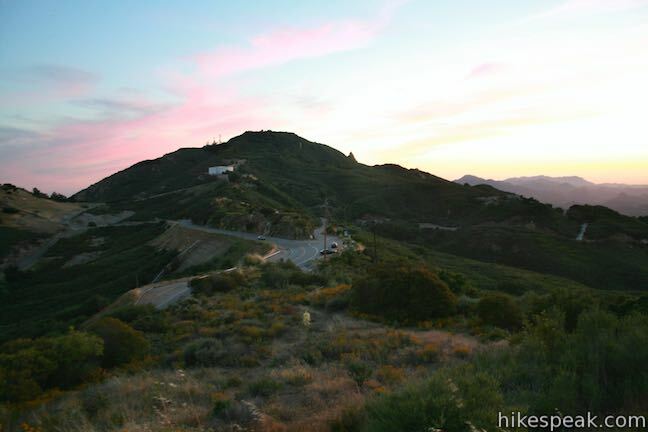 This 7.5-mile hike combines Stunt High Trail and a section of the Backbone Trail to visit the 6th tallest summit in the Santa Monica Mountains. 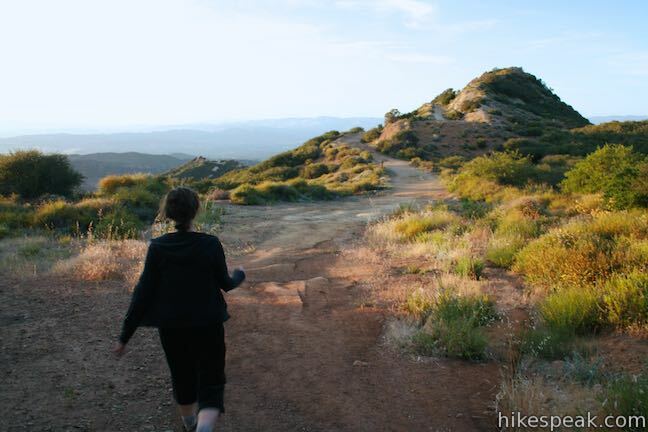 The trails in the beautifully sculpted Red Rock Canyon are 2.5 and 5.2 miles in length. 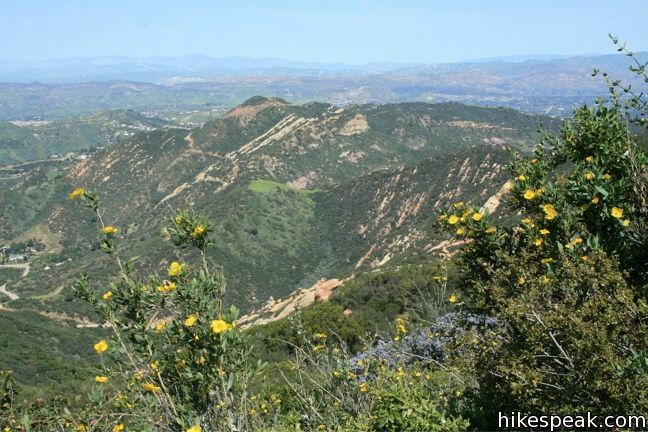 This 3.6-mile hike travels an easy-to-follow fire road, climbing 900 feet to panoramic views of the Santa Monica Mountains and San Fernando Valley. 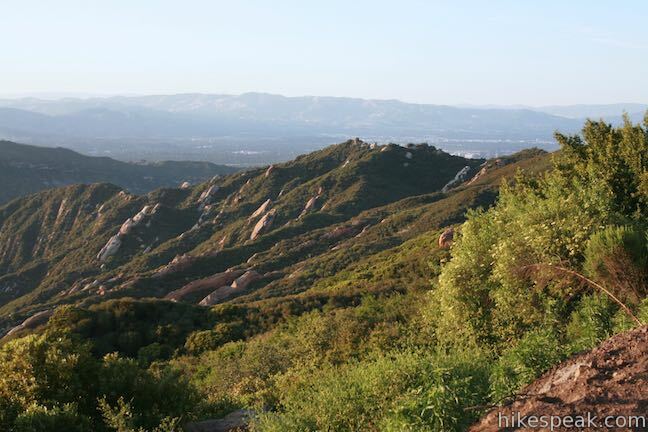 This 3-mile hike in Summit Valley Edmund D. Edelman Park travels down a canyon on Viewridge Trail (also known Santa Maria Canyon Trail) to Summer Hill Ranch Road where there are sweeping views over Topanga and the Santa Monica Mountains from Canyon Overlook. 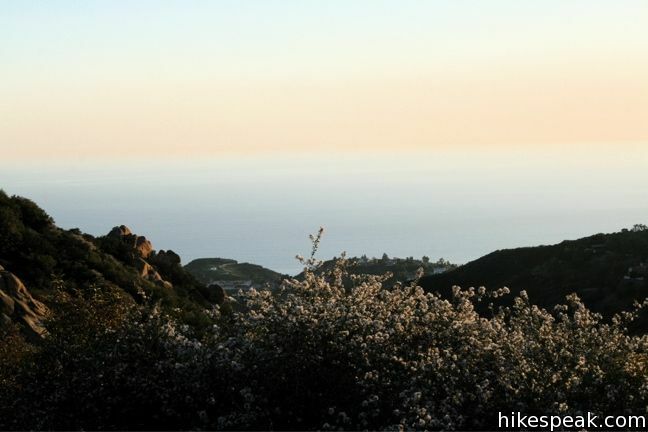 This 6.7-mile round trip hike heads up to the overlook from the opposite direction, starting at Trippet Ranch, Topanga State Park's main trailhead. 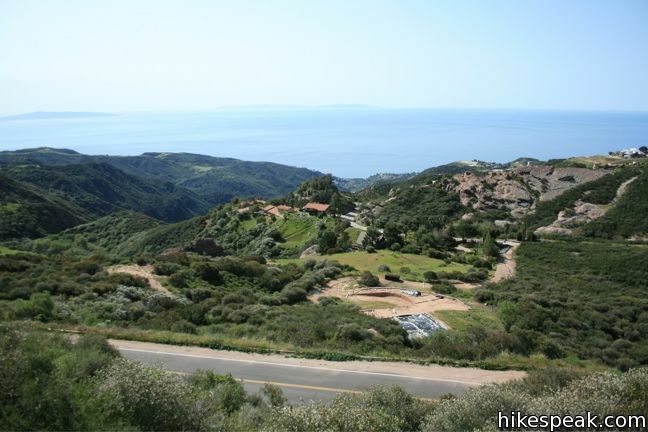 Looks like I’m heading back to Malibu! 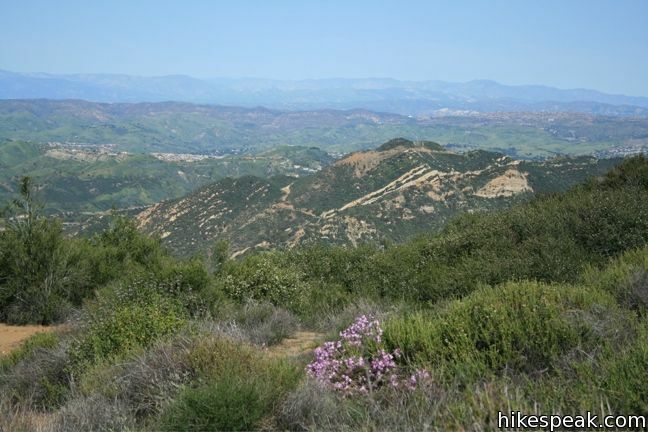 This trail was unbuilt in 1990 when I rode into the “meadows”on my great horse Suny and was amazed the Backbone trail was stymied into an end as the difficulty and no $$ to build it.Then I was elected president of ETI(corral 63}where Grant of Calamigos Ranch and I co-produced the Dwight Yoakum Hondo Cyn trail benefit for the Santa Monica Mtns.When we had seed $$ we partnered with the Santa Monica Mtns Concervancy to build it. 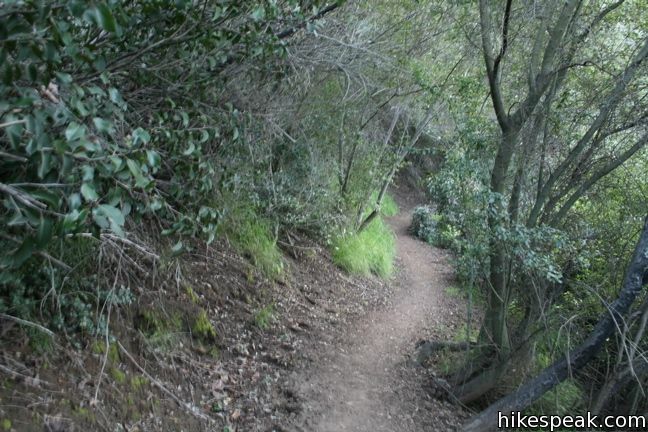 I hesitate to rave about this trail because then it might get crowded. But it’s lovely. Start early to get shade. 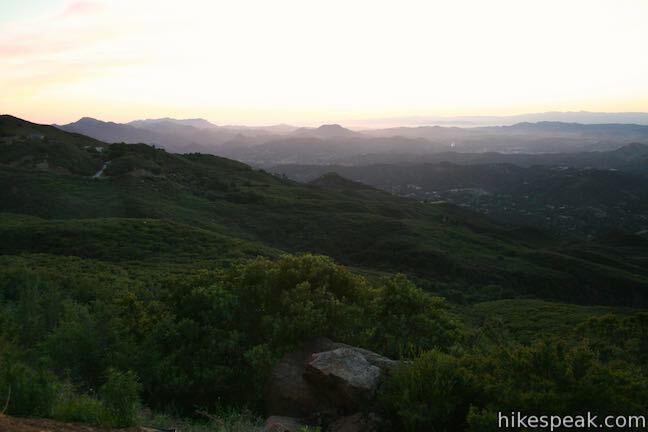 Watch out for a lot of poison oak year-round and for ticks in season. 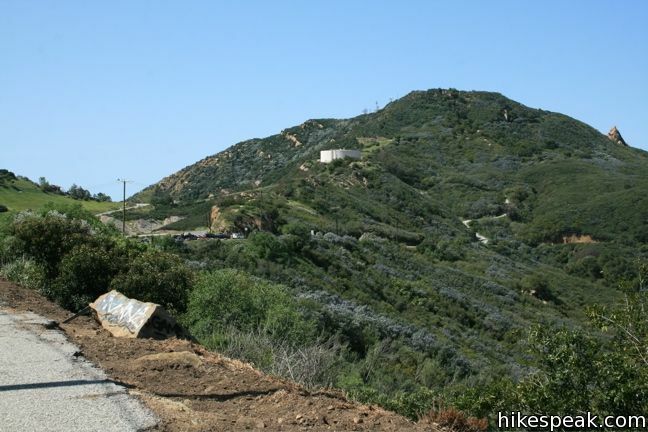 No bikes or dogs–the sheriffs even check at the lower trailhead. 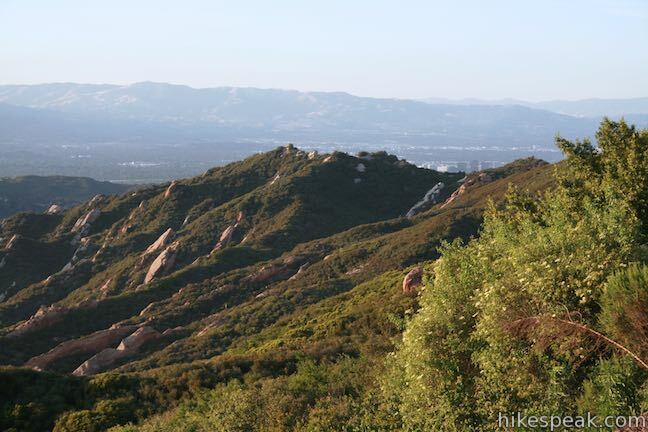 Be sure to check out aptly named Fossil Ridge at Stunt Rd. 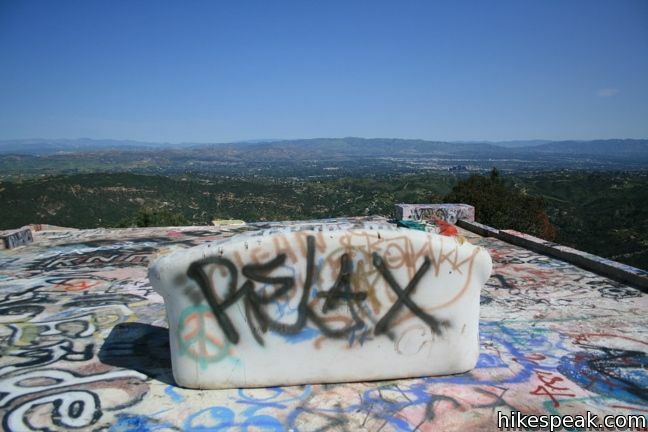 As Mike F. noted, dogs are no longer allowed on this trail. 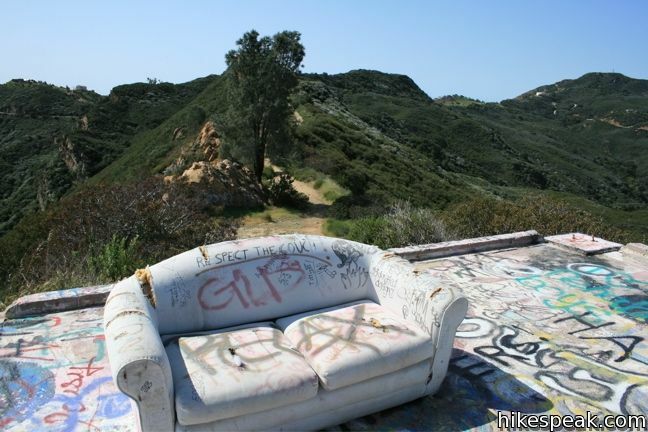 However, we do see dogs here and evidence of dog activity from humans too rude to pick up the messes. I’ve never seen a sheriff or ranger checking for dogs or bikes. We saw two groups of people with dogs off the leash today. It was very obvious they weren’t picking up after them. Pretty annoying. 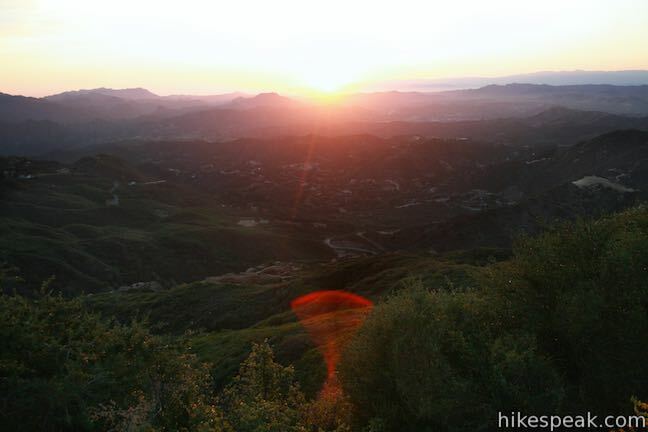 I LOVE Hondo Canyon. It is magical, mystical, majestic and exquisite. 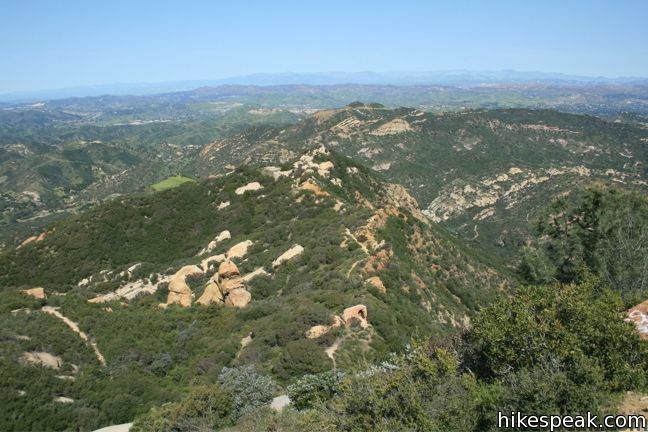 I love the varied topography, the rare and beautiful flowers, naturally sculpted rocks and lizards of many colors (e.g. green, orange) and sizes. 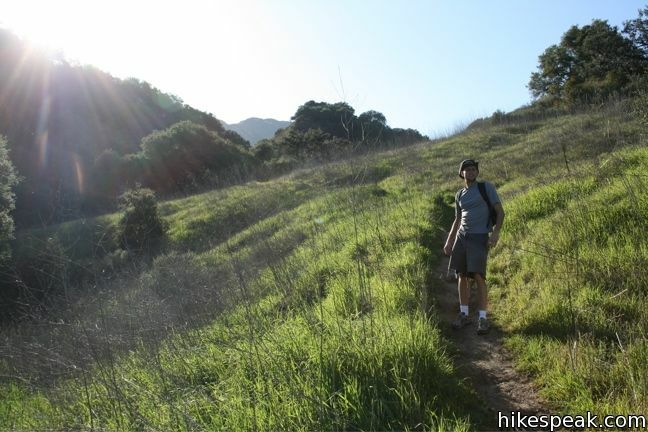 The hike itself is perfect, if you like a combination of challenging to moderate to easy, in your hiking/walking workout. The views are spectacular from every single vantage point; and, of course, the coup de gras is the grande finale at the very top….of the world! You won’t be disappointed. 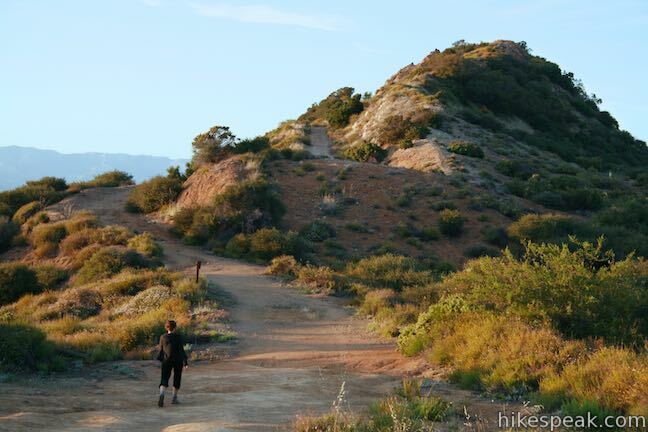 Wear solid hiking boots, thick socks, and take several band-aids. 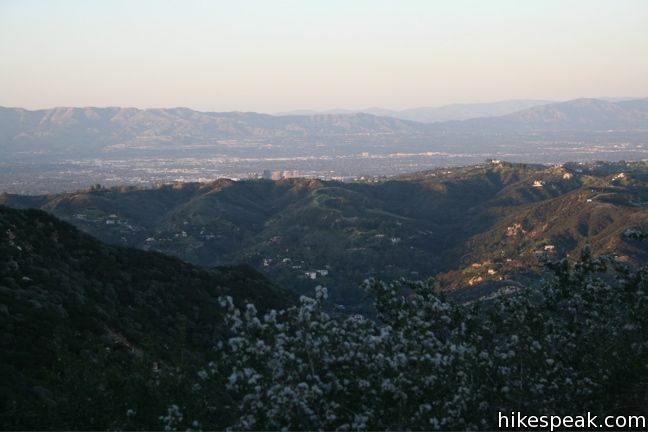 Did this hike today. 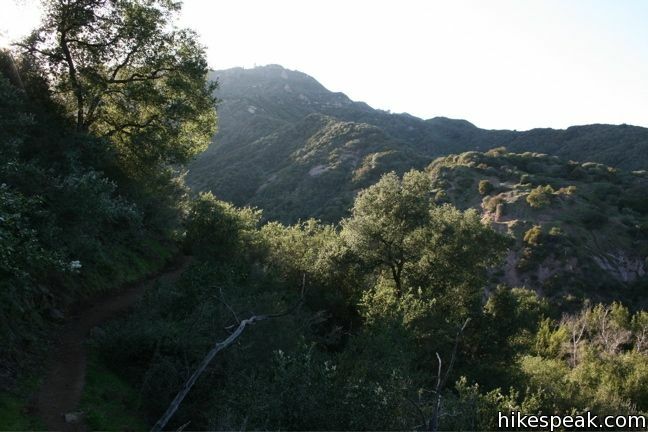 It was quite warm, though there is a lot shade along most of the trail. Not much of a breeze, though. 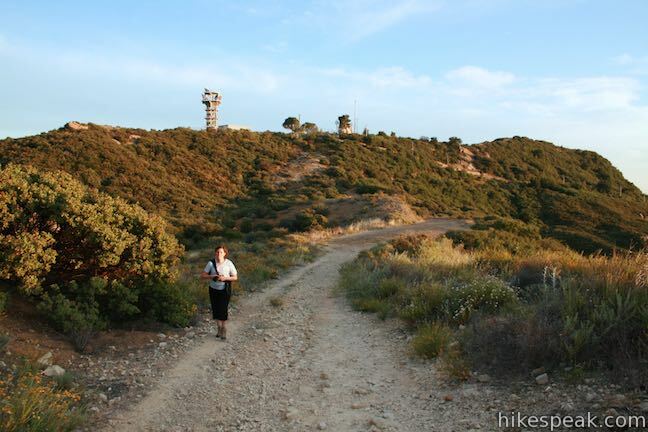 Most notable thing is that on the way up it didn’t seem all that steep. 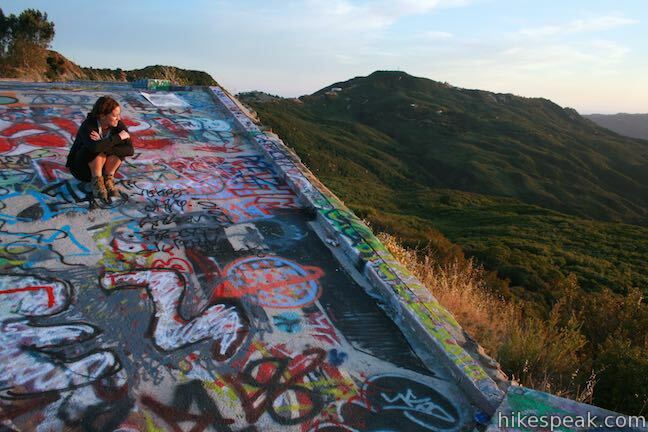 However, when heading down it became apparent why my heart rate was so elevated. 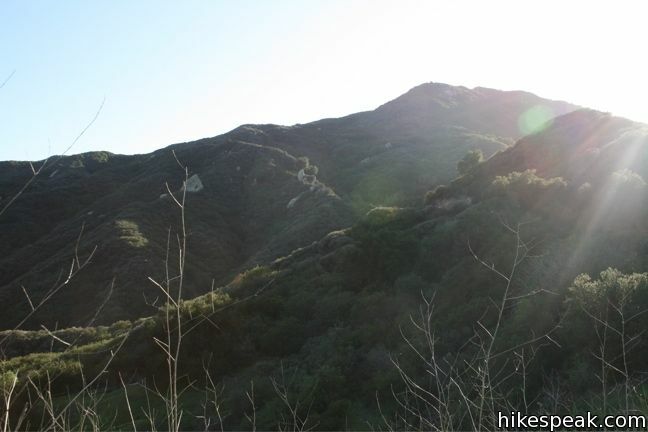 This hike is a bear, especially with the heat. 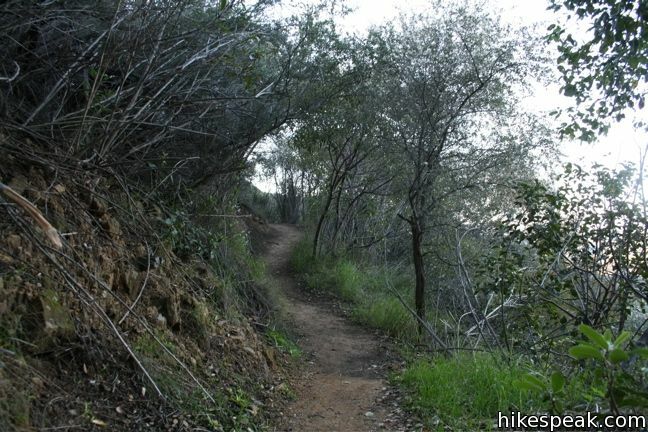 Still, it was overall very pleasant, and the trail was fairly empty.